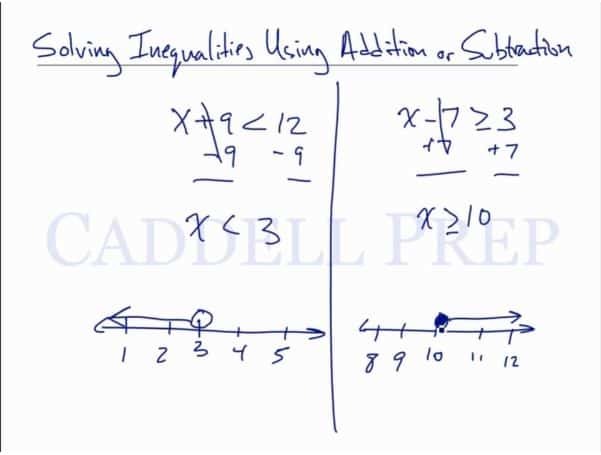 In this video, we will be learning how to solve inequalities using addition or subtraction. Let’s go over how to solve inequalities using addition or subtraction. Solving this is similar to a regular equation except for the inequality sign instead of an equal sign. Let’s solve for by subtracting from both sides of the inequality. We can graph this by drawing a number line then encircle the number then draw a line to the left which represents the numbers less than . Now, let’s take a look at subtraction. To solve , let’s just add on both sides. Now, let’s graph it by drawing a numbe line. Let’s draw an open circle on and draw a line to the right to represent numbers greater than . If we change the sign of into , then our answer would be . Our graph will have a solid circle on instead of an open circle. Then the line is still going to the right to represent numbers greater than .